$50 – for each additional sibling. Liability Waivers signed, copy of Birth Certificates given and Fees paid MUST be done before wrestlers can enter the wrestling room. We have singlets that can be rented for $65 and a $50 deposit will be given when singlet returned at the end of the current season. We will also have singlets to purchase if you choose as well. Contact Tiffany Evans 918-876-2287 or Casey Evans 405-496-0491 for additional information. BWC is an organization committed to motivating, encouraging, and inspiring wrestlers to develop and grow physically, mentally and emotionally while developing character, leadership, and integrity through the sport of wrestling. We will do our best and view coaching as a privileged responsibility. BWC coaches work hard to develop their wrestlers. They work hard to instill pride, poise, and self-confidence. 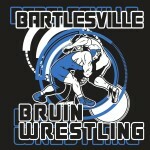 We are excited to be a growing club and helping the youth of Bartlesville and surround areas.